Tata Teleservices Limited (TTSL) has launched ‘Insta Conference’ – an audio conferencing service using XOP Network’s Universal Service Node (USN) platform. Insta Conference service allows a customer to instantly convene a voice conference with a pre-selected group of individuals at the press of a key. The service is available to all customers of Tata Walky, Tata Indicom and Tata DOCOMO. 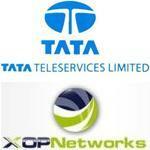 Mr. Sudhir Gupta, CEO of XOP Networks said, “We are very pleased that Tata Teleservices has selected XOP Networks platform to power its Insta Conference service. It is a great honor to be included in Tata Teleservices Limited’s network and to be able to assist in bringing this unique audio conferencing service to Tata Teleservices Limited customers across the country.” Insta-conference significantly reduces the effort required to set up an audio conference call.